Conceived in 1993 and established in 1994, the U.S.-Cuba Trade and Economic Council provides an efficient and sustainable educational structure in which the United States business community may access accurate, consistent, and timely information and analysis on matters and issues of interest regarding United States-Republic of Cuba commercial, economic, and political relations. The U.S.-Cuba Trade and Economic Council does not take positions with respect to United States-Republic of Cuba political relations. The organization is a private, not-for-profit, membership-based corporation that accepts neither United States government funding nor non-United States government funding. Members of the organization have included Decatur, Illinois-based Archer Daniels Midland Company; Minneapolis, Minnesota-based Carlson Companies; Detroit, Michigan-based General Motors Corporation; Schaumburg, Illinois-based Motorola, Inc.; New York, New York-based American International Group; Springdale, Arkansas-based Tyson Foods; Memphis, Tennessee-based FedEx Corporation; Stuttgart, Arkansas-based Riceland Foods, Inc.; Bentonville, Arkansas-based Wal-Mart Stores, Inc.; Greenford, United Kingdom-based GlaxoSmithKline plc; Indianapolis, Indiana-based Eli Lilly and Company; Cleveland, Ohio-based The Sherwin-Williams Company; St. Paul, Minnesota-based 3M; Cincinnati, Ohio-based Chiquita Brands International; Minneapolis, Minnesota-based Medtronic; Oak Brook, Illinois-based Ace Hardware Corporation; Greenwood Village, Colorado-based First Data Corporation; Houston, Texas-based Enron Corporation; Berkshire, United Kingdom-based Cable & Wireless plc; London, United Kingdom-based Barclays Capital PLC; Wiltshire, United Kingdom-based Burmah Castrol Ltd.; and Paris, France-based Credit Lyonnais S.A. amongst other automotive, energy, financial services, healthcare, communications, entertainment, publishing, transportation, real estate, retail, consumer product, and other types of companies from the United States and other countries. The U.S.-Cuba Trade and Economic Council was the first and only organization within the United States to have received letters of cooperation from the Chamber of Commerce of the Republic of Cuba, the Ministry of Foreign Trade of the Republic of Cuba, the Ministry for Foreign Investment and Economic Cooperation of the Republic of Cuba, the Ministry of Tourism of the Republic of Cuba, the Ministry of Public Health of the Republic of Cuba, the Ministry of the Steel-Mechanical and Electronic Industry of the Republic of Cuba, the Ministry of Foreign Affairs of the Republic of Cuba, and the National Assembly of the Republic of Cuba. The U.S.-Cuba Trade and Economic Council is the source of record of the United States business community for nonpartisan commercial information and economic information relating to the Republic of Cuba. The organization is referenced every day by media, companies, governments, academics, and individuals from throughout the world. The U.S.-Cuba Trade and Economic Council interacts with officials of The White House, United States Department of State, United States Department of Commerce, United States Department of Agriculture, United States Department of the Treasury; United States Department of Justice, United States Department of Transportation, Department of Homeland Security; federal agencies; and with members and staff of the United States Congress. The organization also interfaces with representatives from country governments. The U.S.-Cuba Trade and Economic Council has a focus on issues including United States law and United States government regulations relating to commercial activities within the Republic of Cuba by United States-based companies and travel to the Republic of Cuba by representatives of United States-based businesses. The ECONOMIC EYE ON CUBA©, published by the organization, has a readership that includes senior-level executives of United States-based companies, senior-level executives of non-United States-based companies, government officials (United States, Republic of Cuba, and other countries), organizations, and newspaper, magazine, television, and radio journalists from throughout the world. The ECONOMIC EYE ON CUBA© is one of the most widely-sourced publications regarding the Republic of Cuba. The Internet sites of the U.S.-Cuba Trade and Economic Council, www.cubatrade.org and www.cubacouncil.org, are accessed daily by governments, companies, individuals, and journalists from throughout the world. The U.S.-Cuba Trade and Economic Council provides coordination assistance and briefing materials to company executives, government (United States and other countries) officials, Members of Congress, governors and journalists who visit the Republic of Cuba. The U.S.-Cuba Trade and Economic Council first placed into the public domain an opinion by the Office of Foreign Assets Control (OFAC) of the United States Department of the Treasury which authorized entities subject to United States law to have indirect non-controlling investments in the Republic of Cuba. On 4 March 1994, the OFAC issued the opinion to Mr. John S. Kavulich, who subsequently became the president of the U.S.-Cuba Trade and Economic Council. The opinion stated that a United States business or individual subject to United States law may make a secondary market investment in a third-country business which has commercial dealings within the Republic of Cuba provided that the investment does not result in control-in-fact of the third-country business by the United States investor and the third-country company does not derive a majority of its revenues from business activity within the Republic of Cuba. Secondary market investment that falls short of a controlling interest in such a business is not prohibited. Members of the U.S.-Cuba Trade and Economic Council signed the first and second commercial contracts with a Republic of Cuba government-operated entity for the first direct export of agricultural commodities from the United States to the Republic of Cuba since 1963. The exports were authorized under the Trade Sanctions Reform and Export Enhancement Act (TSREEA) of 2000; and were implemented through licenses issued by the Bureau of Industry and Security (BIS) of the United States Department of Commerce and the OFAC. In 2001, the U.S.-Cuba Trade and Economic Council initiated the strategy of multi-state sourcing by United States exporters for agricultural commodities. A member of the U.S.-Cuba Trade and Economic Council received the first licenses from the OFAC to organize and then conduct a U.S. Food & Agribusiness Exhibition in the Republic of Cuba, held in September 2002. The U.S. Food & Agribusiness Exhibition had 923 representatives from 293 exhibitors (located in thirty-two states, District of Colombia, and Commonwealth of Puerto Rico). Approximately 16,000 Republic of Cuba nationals visited the U.S. Food & Agribusiness Exhibition. Decatur, Illinois-based Archer Daniels Midland Company was the primary sponsor of the U.S. Food & Agribusiness Exhibition. 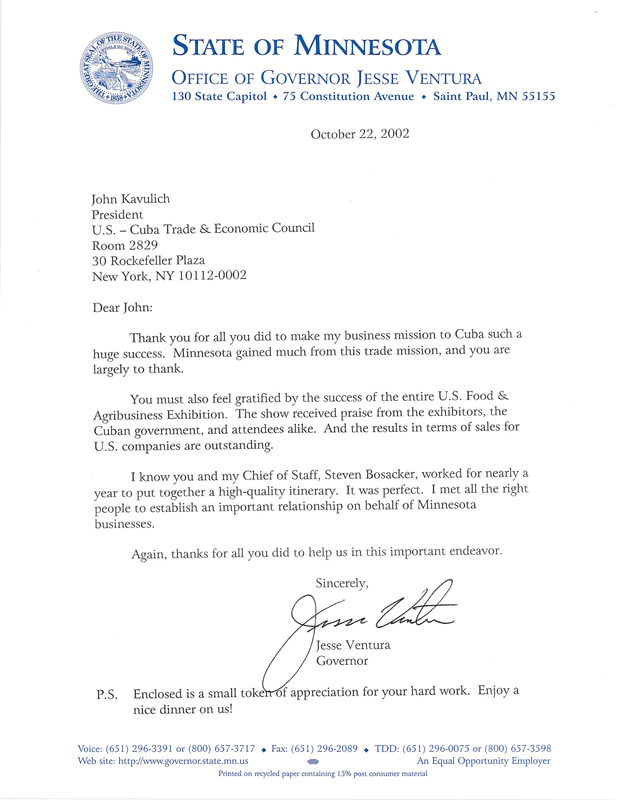 The U.S. Food & Agribusiness Exhibition was and remains the single largest grouping of United States-based companies to visit the Republic of Cuba for a commercial purpose in more than fifty years and the single largest grouping of representatives of United States companies to visit the Republic of Cuba at one time under license from the OFAC. A member of the U.S.-Cuba Trade and Economic Council received the first licenses from the OFAC to organize and then conduct a U.S. Healthcare Exhibition in the Republic of Cuba, held in January 2000. Approximately 8,000 Republic of Cuba nationals visited the U.S. Healthcare Exhibition. Until 2002, the U.S. Healthcare Exhibition was the single largest grouping of United States-based companies to visit the Republic of Cuba for a commercial purpose in more than forty years and the single largest grouping of representatives of United States companies to visit the Republic of Cuba at one time under license from the OFAC. The company which organized the U.S. Healthcare Exhibition also received a license from the OFAC to present a United States Pavilion at the bi-annual “Salud Para Todos” (Health for All) Exhibition and a license from the OFAC to present a second U.S. Healthcare Exhibition in January 2002. A member of the U.S.-Cuba Trade and Economic Council received the first license from the OFAC to participate in a Republic of Cuba government-operated healthcare exhibition. A member of the U.S.-Cuba Trade and Economic Council received the first “bundling” license from the BIS that included almost one hundred different healthcare-related products with a combined value of approximately US$800,000.00. The importance of this license was 1) the BIS had previously required a separate license for each transaction between a United States-based healthcare company and a Republic of Cuba-based, Republic of Cuba government-operated entity and 2) the United States-based company was not required a have an existing order for the healthcare products from a Republic of Cuba-based, Republic of Cuba government-operated entity. With the assistance of the U.S.-Cuba Trade and Economic Council, members of the organization were issued the first, second, and third licenses from the OFAC for their representatives to travel to the Republic of Cuba to identify sales opportunities for medical equipment, medical instruments, medicated products, medicines, medical supplies, and pharmaceuticals. A member of the U.S.-Cuba Trade and Economic Council received the first license from the BIS authorizing temporary export of healthcare products to the Republic of Cuba for demonstration purposes during discussions to explore sales opportunities. The U.S.-Cuba Trade and Economic Council assisted with the coordination of the first and second Familiarization Tours (FAM TOURS) to the Republic of Cuba by senior-level executives of United States-based airline companies, hotel companies, cruise line companies, vehicle rental companies, tour operators, financial services companies, and travel agents. The visits were “fully hosted” as authorized by the OFAC and were sponsored by Republic of Cuba government-operated Havanatur. The U.S.-Cuba Trade and Economic Council received the first license from the OFAC for a delegation of representatives of the United States music industry to visit the Republic of Cuba to identify export and import opportunities. Two of the participating companies entered into sales agreements. Members of the U.S.-Cuba Trade and Economic Council provided approximately US$100,000.00 in funds, products, and services in support of the visit of His Holiness John Paul II to the Republic of Cuba in January 1998. Contributions included the use of two general aviation aircraft to transport United States-based Cardinals, Archbishops, and Bishops within the Republic of Cuba. One member of the U.S.-Cuba Trade and Economic Council provided the red carpet on which the Holy Father took his first steps upon arriving in the Republic of Cuba. The U.S.-Cuba Trade and Economic Council coordinated the initial distribution within the Republic of Cuba for Cigar Aficionado magazine. Speakers at functions for members of the U.S.-Cuba Trade and Economic Council have included the Minister of Foreign Affairs of the Republic of Cuba; Minister of Economy and Planning of the Republic of Cuba; First Deputy Minister of Foreign Affairs and Chief of the Cuban Interests Section in Washington, D.C.; Vice Minister for Foreign Investment and Economic Cooperation of the Republic of Cuba; Permanent Representative of the Republic of Cuba to the United Nations; Ambassador of Canada to the Republic of Cuba; and representatives of non-United States-based companies with operations located in the Republic of Cuba; among others. The U.S.-Cuba Trade and Economic Council has a focus upon issues of interest to United States certified corporate claimants. The organization has members who have claims certified with the United States Foreign Claims Settlement Commission (USFCSC) in Washington, D.C.; and a representative of the U.S.-Cuba Trade and Economic Council has traveled with certified claimants to the Republic of Cuba for the purpose of settlement discussions. The U.S.-Cuba Trade and Economic Council has provided witnesses for hearings about Republic of Cuba-related issues before the United States Congress and before agencies of the United States government. Culture Shock!- A Guide to Customs and Etiquette published by Times Books International, states that the U.S.-Cuba Trade and Economic Council is the “best source of information on doing business in Cuba” and “John Kavulich, president of the U.S.-Cuba Trade and Economic Council and probably the person who has studied the Cuban business scene better than any other living foreigner…” A senior official of the United States Department of State described Mr. Kavulich, who has visited more than 110 countries, as "prolific." Note: the presidency of the organization is a non-compensated position (expenses are reimbursed) and Mr. Kavulich neither provides Republic of Cuba-related consulting services nor has financial relationships with Republic of Cuba-related service providers. The organization does not believe appropriate for a director, officer, employee, or advisor of a not-for-profit organization to seek, provide, or direct revenue producing activity to an entity controlled or affiliated with a director, officer, employee, or advisor of the organization. Relevant agencies of the United States government believe such activities inconsistent with not-for-profit purposes.